In the second inning of yesterday's matinee in Boston, Mike Aviles struck out. Well, he should have struck out. He swung and missed and everything. But the home plate umpire ruled that catcher Gerald Laird had short-hopped the catch, and on his second try, Aviles stroked an RBI single. It would lead to a three-run inning, and an ejection of Leyland—by the first-base umpire, who's apparently a champion lipreader, since Leyland was in the third-base dugout at the time. After the game, Leyland snapped. Here's the transcription, via USA Today, but you really must watch the video. "I mean, there should not have been a second-inning rally. There were three outs. I've been in the game a long time, and when the catcher catches the ball and it's strike three, you call the guy out. It's that simple, isn't it? "I mean, you guys need to write something and hold people accountable! You know what? We're all accountable in this business! All of us are accountable! And when I say all of us, I mean everybody that's involved in the game needs to be held accountable! "OK? That's exactly what needs to be done. There should not have been a rally in that inning. Now anybody that saw that, have the nerve to write what you saw and say it. Because I'm not going to sit here and rip umpires. But you saw what you saw, clearly saw what you saw -I just saw it for the 10th time - clearly saw what you saw, write it and say something once in a while. Have the nerve to say something. 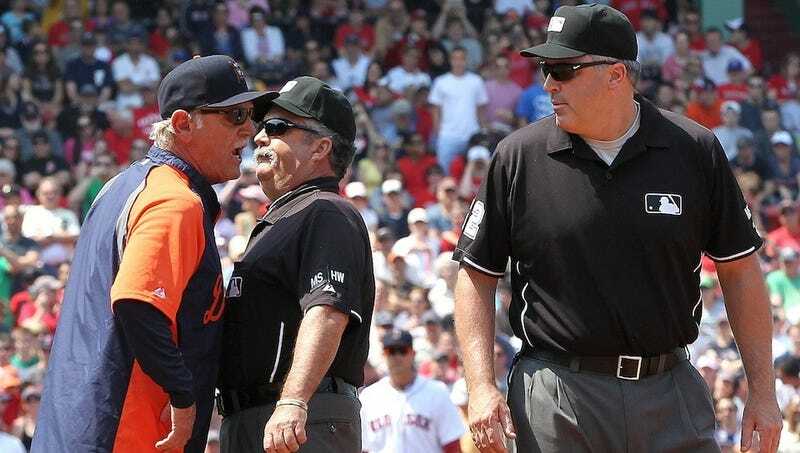 The interesting part is not that Leyland is calling out the umpires—it happens, and he'll probably be fined, and we'll all move on. I like that Leyland is calling out the media. He knows umpires aren't going to be held accountable by the rant of a spurned manager. But maybe, just maybe, if the writers actually write and the reporters report that some umpires egregiously blew a call, refused to ask for help, and handed out ejections at the flap of a lip, maybe then MLB might take some notice. So here you go, Jim. Home plate umpire Jeff Nelson missed the strike-three call, and couldn't be convinced by a lack of dirt on the ball, and didn't even deign to consult his crewmates. And first-base ump Bill Welke, who already has an ejection rate nearly twice the league average, decided to toss Leyland despite not actually hearing what Leyland was saying. That's some terrible umpiring, and exactly the sort of thing we thought MLB was pretending it cares about. MLB, you paying attention? MLB Suspends Umpire Bob Davidson For "Repeated Violations Of Situation Handling Standards"